Thirty-two readers love this post. One of the dishes that we are known for is our Kubaneh bread. Nur is partnered with Breads Bakery and we get the fresh baked bread delivered to us daily. Kubaneh is a Yemenite bread that is a cross between brioche and challah. Rich, savory and buttery. Perfect for French Toast! One of the dishes that I can cook in my tiny kitchen! Or I should say one of the dishes that I actually can cook! I love to add different liquor to my french toast and I almost always add vanilla as well. Parce Rum is the perfect rum for my dish. It’s delicious,rich flavor blends in perfectly with the butteriness of the kubaneh and the sweetness of vanilla. I als saute some walnuts and macadamia nuts in butter and maple syrup to top it off. “Parce” is casual for good friends. 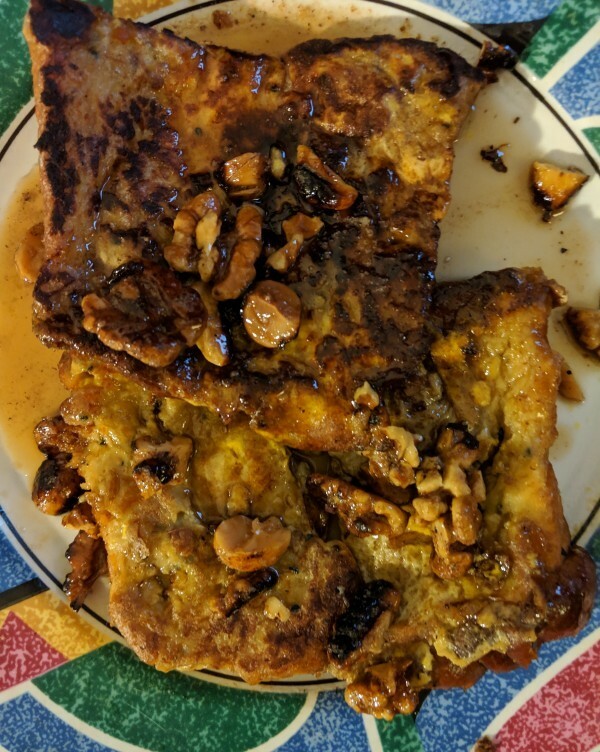 So invite some good friends over for a chat and make them some of my Kubaneh Vanilla Rum French Toast. They’ll like it so much that maybe next time they’ll bring over some booze to cook with for the next gathering! Cheers and enjoy! Melt half the amount of butter in a frying pan. In a bowl combine all ingredients except, maple syrup, nuts and butter, whisk thoroughly. Dip sliced bread into bowl and lightly fry . Take slices out and dip again and then fry till golden brown.